CLICK HERE to see the 2017 Catalog. 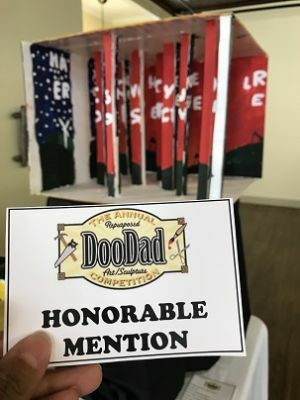 Below are photos from the 2017 DooDads exhibit and awards ceremony. Click on the image to get a download of the full-sized picture! 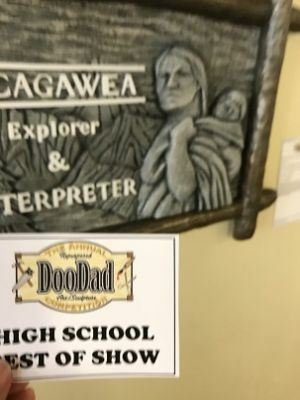 Artist's Statement: I really like Native American history. They are neat because they didn't use any electricity, only man powered things. 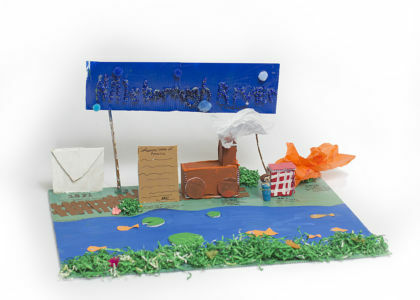 The theme for this piece is U.S. History, from Tinker K-8. The students who created it are Jackson Hamman. The statement from the artists is: Americans of all races and political parties must come together today to solve our problems and make progress towards a bright future. The theme for this piece is Tampa History, from Tampa Regional Artists. The students who created it are Keira O'Brien, Kate O'Brien, Kai Wheelright, Claire Stockstad . The statement from the artists is: Since we take art classes each week at Old Hyde Park Art Center, it was the perfect choice for our project. It was fun to be working at the site we were creating--having the actual building right there to refer to throughout the entire process. 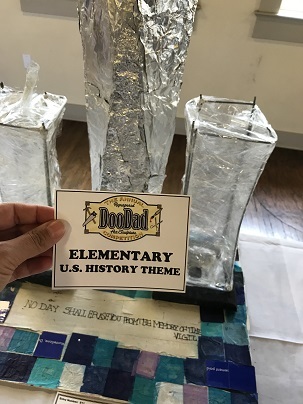 The theme for this piece is U.S. History, from Lamb Elementary. 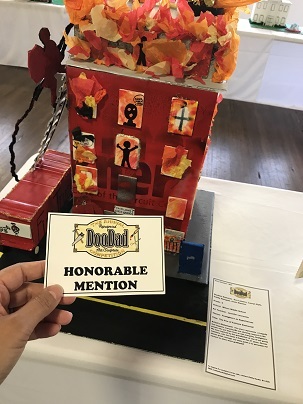 The students who created it are Yetzabeth Camacho, Asia Collins, K'Mari Crawford, Lilliana Crespo, Anthony Ezenya, Micah Gardener, Jared Lopez, Elijah Payne, Madisyn Sepulveda, Marcus Stewart. The statement from the artists is: We made the original Twin Towers see-through because even though the original buildings are gone, they shouldn’t be forgotten. If you look through them you will see the pools that take the place of the original Twin Towers at the memorial in New York. The new Freedom Tower stands in the middle as a symbol of strength, freedom and redemption. On the base of the sculpture you will see a statement and a mosaic. This is meant to look like the wall inside the 9/11 memorial and a reminder to not forget our fallen heroes. 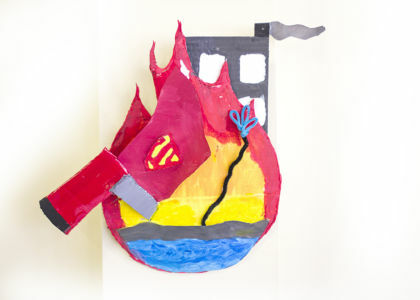 The theme for this piece is Firefighters as Superheros, from Kenly Elementary. The students who created it are 5th Grade class of 2017. 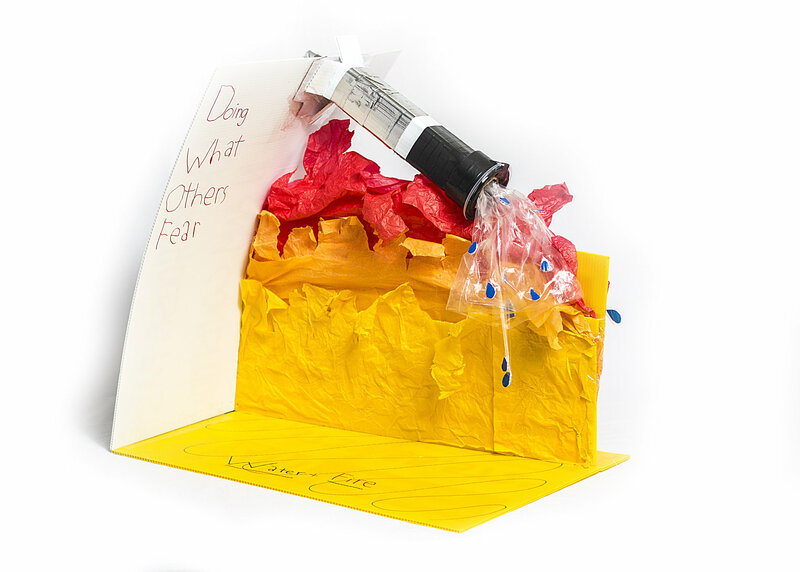 The statement from the artists is: Kenly Elementary 5th graders wanted to create a piece of art that celebrated the amazing things firefighters have to do every day and how much of what they do is amazing, like a Real superhero. 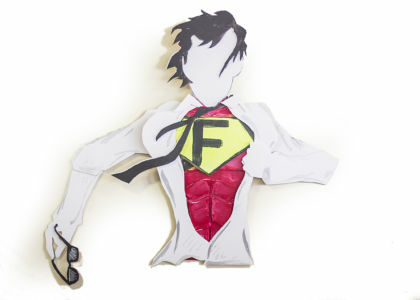 We wanted our sculpture to have the look of a comic book in 3-D. It was fun to work together as a whole grade level to create a piece of art to enter into the Doodad competition this year. The theme for this piece is Tampa History, from Homeschool students. The students who created it are Alex Wagner. The statement from the artists is: I really like Native American history. They are neat because they didn't use any electricity, only man powered things. The theme for this piece is U.S. History, from Homeschool students. The students who created it are Katie Yarbrough. The statement from the artists is: Since we were supposed to use campaign signs, the White House seemed like a good idea. 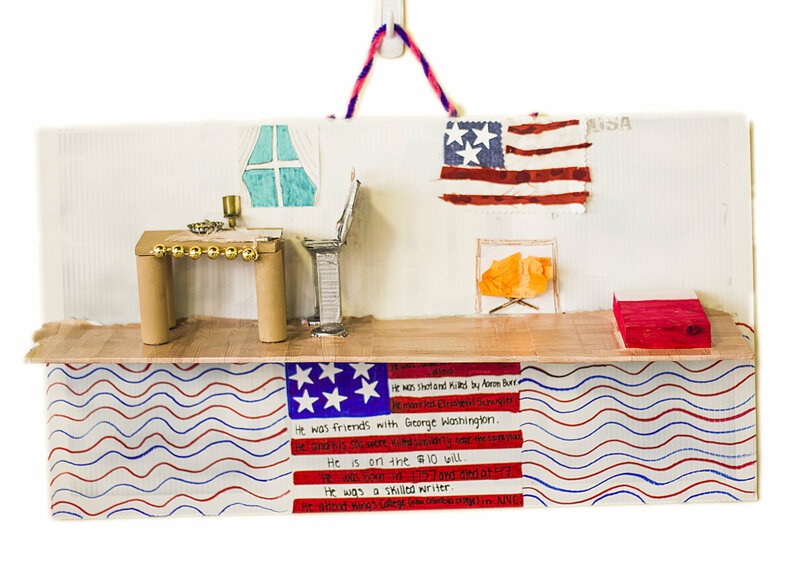 The theme for this piece is U.S. History, from Homeschool students. The students who created it are Liam Green. The statement from the artists is: Let the nation rise just like this flag! Remember the veterans of the battle of Iwo Jima. 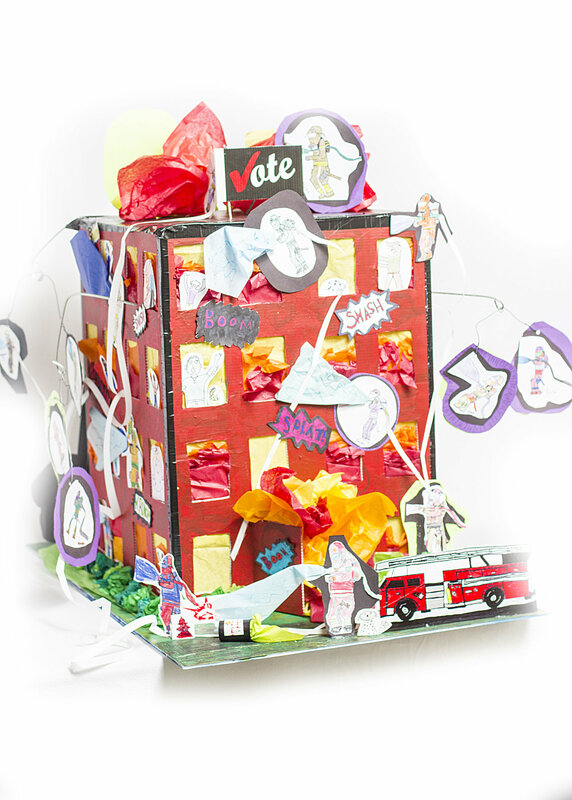 The theme for this piece is Firefighters as Superheros, from Homeschool students. 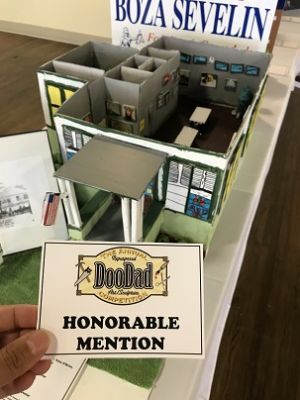 The students who created it are Ethan Green. The statement from the artists is: What I made shows very simply what firefighters do. The theme for this piece is Firefighters as Superheros, from Cypress Creek Elementary. 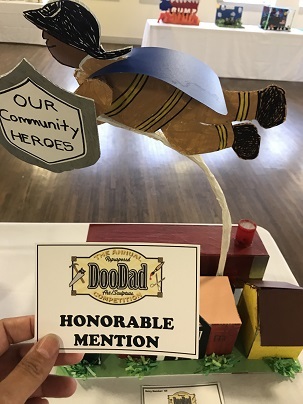 The students who created it are Jurnee Bailey, Sara Garcia, Desirae Rodriguez, Lillie Vance, Emmalee Simmons, Alexis Ackroyd, Tavares Anderson, Caleb Williams, Krysten Crawford. The statement from the artists is: We decided to make a sculpture that honors the firefighters in our community because they keep us safe. They help our school. They are our heroes because they are brave and strong. Firefighters are the mightiest! They have always been there for everyone! The theme for this piece is Firefighters as Superheros, from Bailey Elementary. The students who created it are Macey Riley. The statement from the artists is: I created this sculpture to express my appreciation for what firemen do because they are my heroes. The theme for this piece is Firefighters as Superheros, from Bailey Elementary. The students who created it are Dylan Smith. 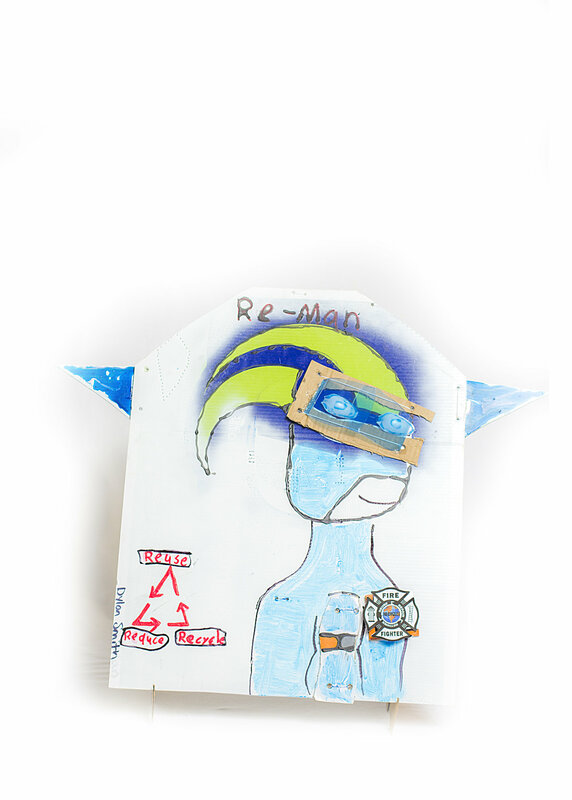 The statement from the artists is: RE-Man's shield is powerful. Without his shield he would be vulnerable. His shield gives him powers to save the world from pollution, and the criminal Mr. Palout. Mr. Palout is a pig, and he wants to cover the world with trash and destroy the world. RE-Man is only in 9th grade, and his name is Jacke. RE-Man’s shield gives him strength, speed, and flexibility. He stands out. He wants everyone to reuse, reduce and recycle. The world depends on him. Can he stop pollution? Can he save the world? Only RE-Man knows. 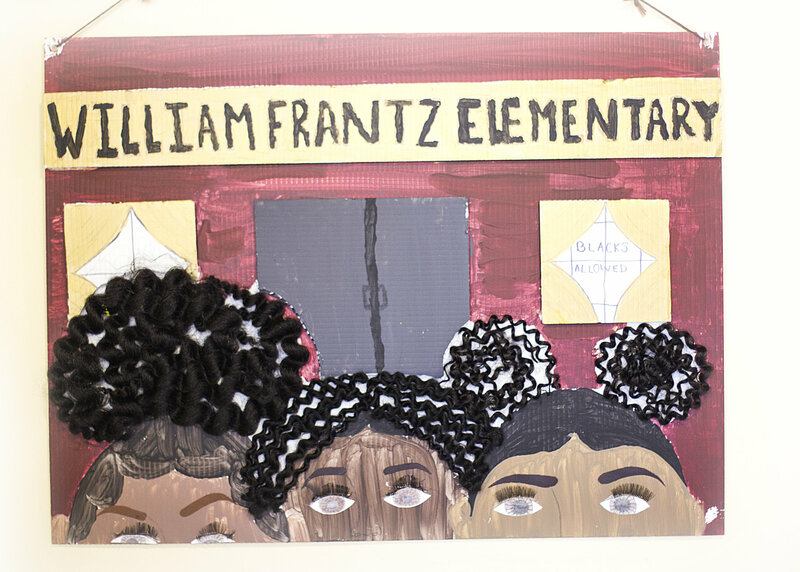 The theme for this piece is Tampa History, from Alafia Elementary. The students who created it are Karis Cosmas, Haleigh Galvan, Sydney Gaumond, Alexis Georgiev, Taylor Gregory, Kayla Hanson, Kaileen Rodriguez. The statement from the artists is: For our project, we created a cigar factory, burgundy colored fire truck, and a building with flames and smoke. Firemen wearing bottle caps for helmets are holding straw hoses with magazine paper water. 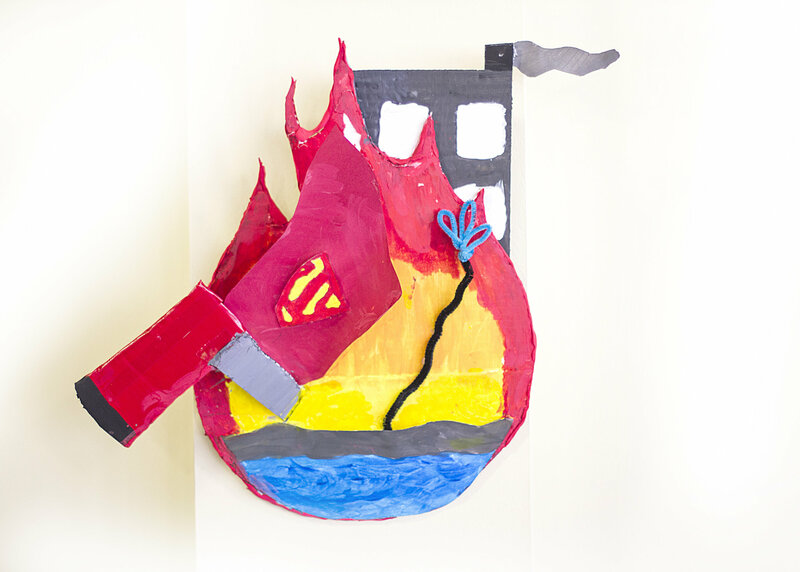 The theme for this piece is Firefighters as Superheros, from Alafia Elementary. 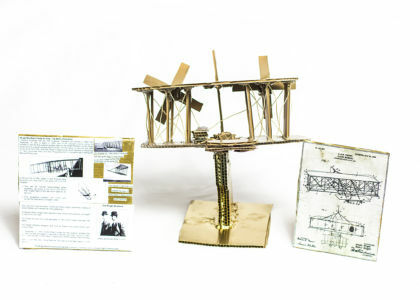 The students who created it are Ella James, Andrew Terrill, William Terrill. 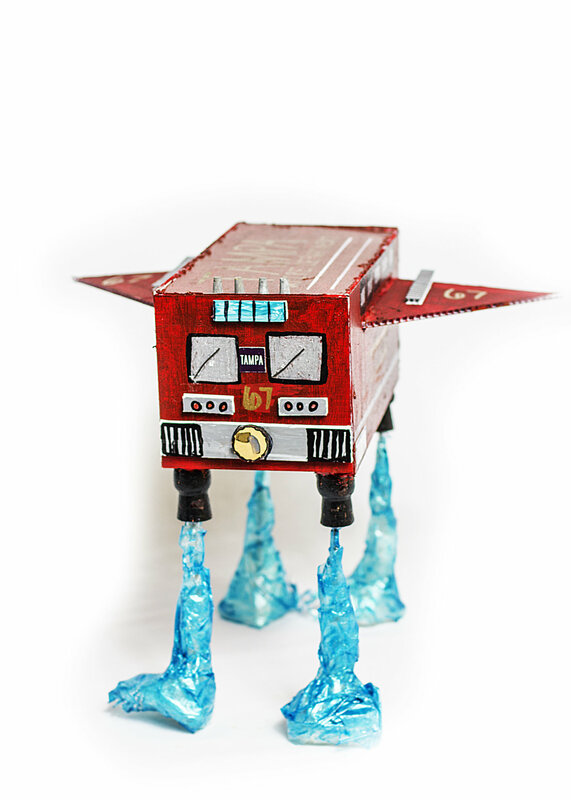 The statement from the artists is: We made a futuristic fire truck from the year 2067 that is shooting water out of it to hover above the ground. 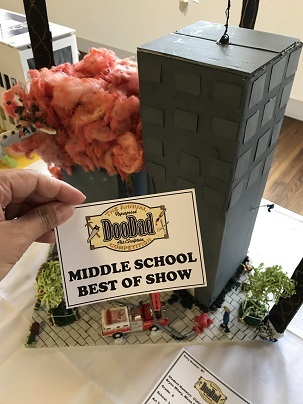 The theme for this piece is U.S. History, from Adams Middle School. 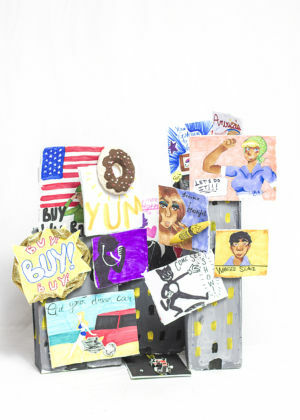 The students who created it are Anthony Perez, Jomar Quinones. The statement from the artists is: We called this "Misunderstood" because when you're quick to judge a book by it's cover, you can't understand or appreciate someone. M10 - Lutz Prep Charter - A Journey Through Time! The theme for this piece is U.S. History, from Lutz Prep Charter School. The students who created it are Ashlyn Riley, Nicole Hebert. The statement from the artists is: We built our structures to portray US history, and how the musical, "Cats," advances to different venues and becomes more and more popular. We want it to give a feeling of happiness and remembrance as our work was inspired by the Neil Simon theater. 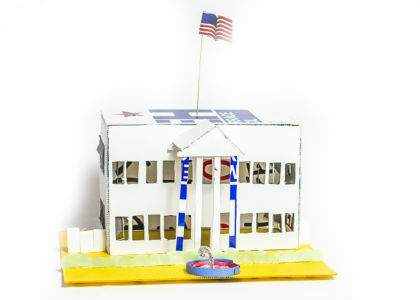 The theme for this piece is U.S. History, from Lutz Prep Charter School. 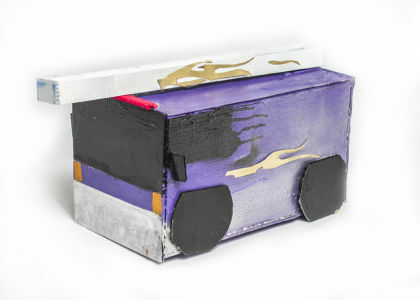 The students who created it are Caitlyn Tihanovich, Adyson O'Connor, Hannah Lindquist. 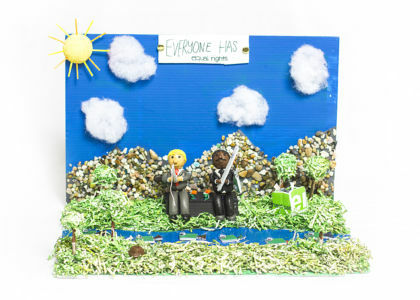 The statement from the artists is: Our project is a forest-looking scene that includes Martin Luther King, Jr. and Donald Trump. We wanted to represent that everyone has equal rights by sitting an African American person next to a white person. We wanted to capture happy emotions within the character’s facial expressions. The theme for this piece is Tampa History, from Lutz Prep Charter School. 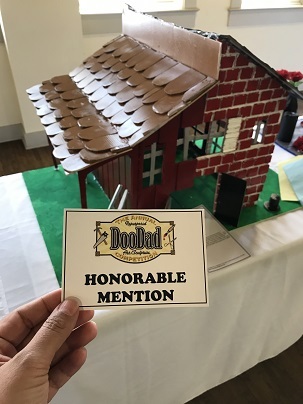 The students who created it are Ryan Williams, Patrick Berans, Peter John Bazzini, Ethan Corscadden, CJ Chalk, Tyler Brown. 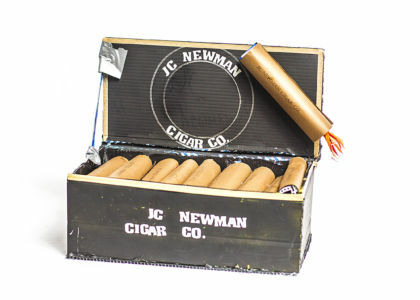 The statement from the artists is: Our project is showing Tampa Bay history which includes our red building, the Tampa Bay Hotel, a Native American fishing village, and cigars. The theme for this piece is Tampa History, from Lutz Prep Charter School. The students who created it are Veda Katta, Saila Roxa. 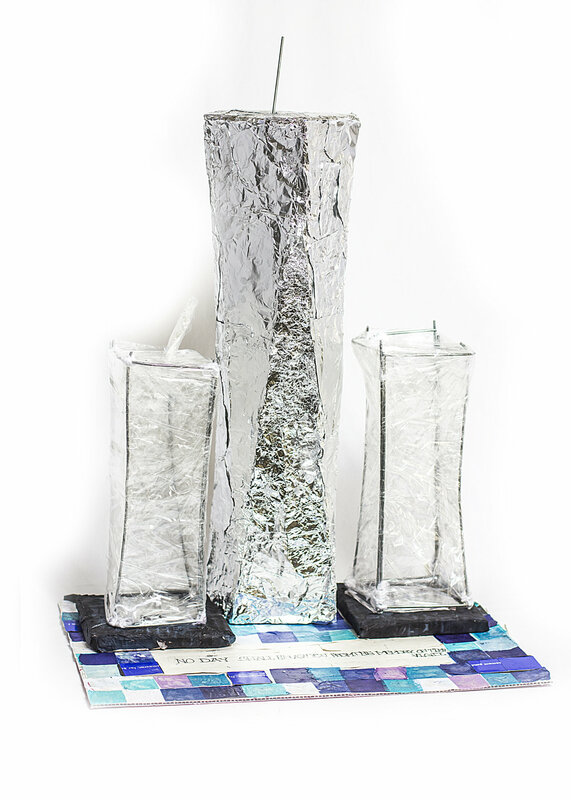 The statement from the artists is: Our piece is a sculpture that displays the Hillsborough River, and along the river there are crucial events that took place in Tampa history.We were heavily influenced by all the events that happened in Tampa that made Tampa what it is today. We're also trying to show how fast time flies, just like the Hillsborough River flowing. The theme for this piece is Tampa History, from Lutz Prep Charter School. The students who created it are Symia Moran, Grace Owen, Vianca Morales. The statement from the artists is: We chose to portray the Orange Blossom because farmers in Tampa grew orange blossoms. We were inspired to make an orange blossom because during our research we found out that June 27th is National Orange Blossom day. 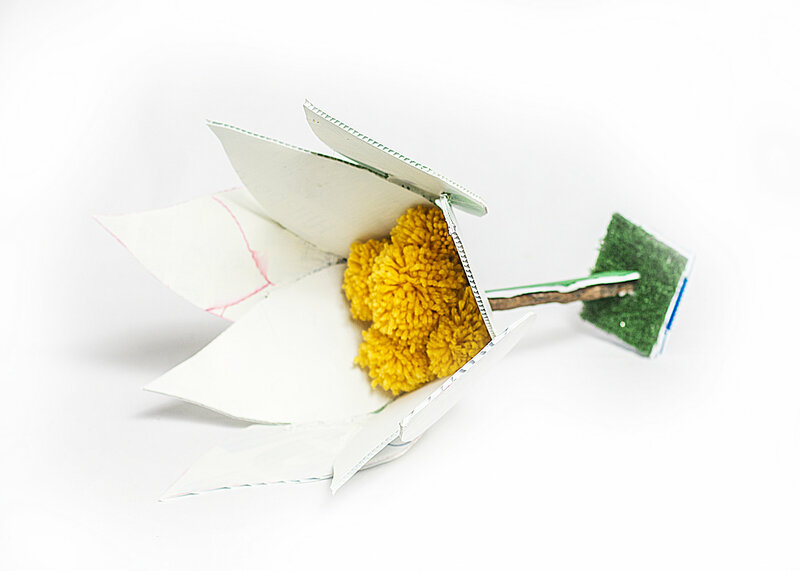 Pom poms represent the pistil of the flower. The theme for this piece is U.S. History, from Lutz Prep Charter School. The students who created it are Ronnie Leder. 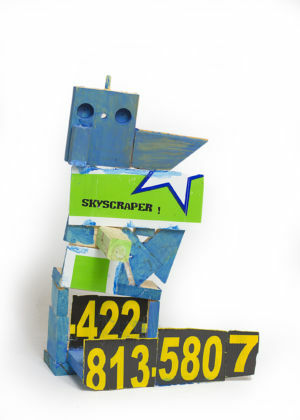 The statement from the artists is: My project is a replica of a U.S. skyscraper. The theme for this piece is Tampa History, from Lutz Prep Charter School. 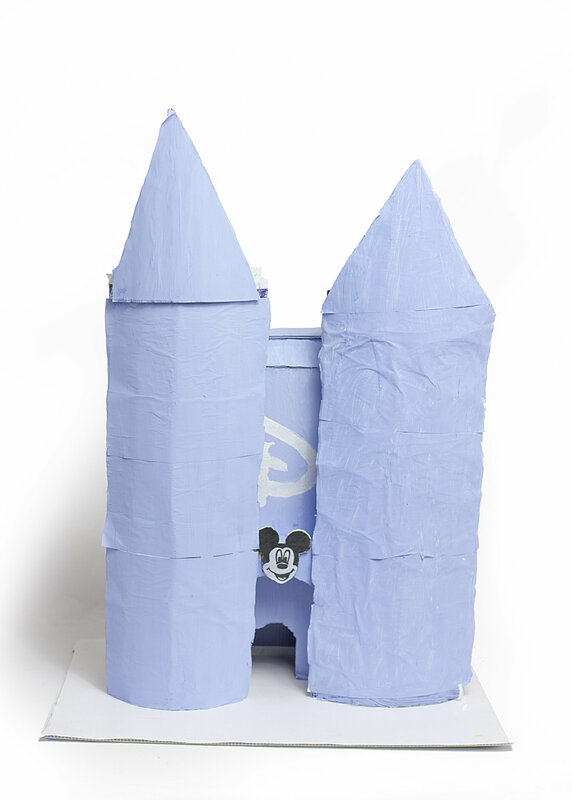 The students who created it are Lucas Carreno, Anna Gore, Jon Williams, Anthony Arteaga, Bella Lehman. The statement from the artists is: We created a cigar box to show Tampa History because Ybor City was known for making cigars. The theme for this piece is U.S. History, from Lutz Prep Charter School. The students who created it are Cason Meyer, Gavin Arrant, Chris R, Will Douglas. The statement from the artists is: We chose to portray one of the many battles in the Civil War, the battle of Chickamauga. The theme for this piece is U.S. History, from Lutz Prep Charter School. 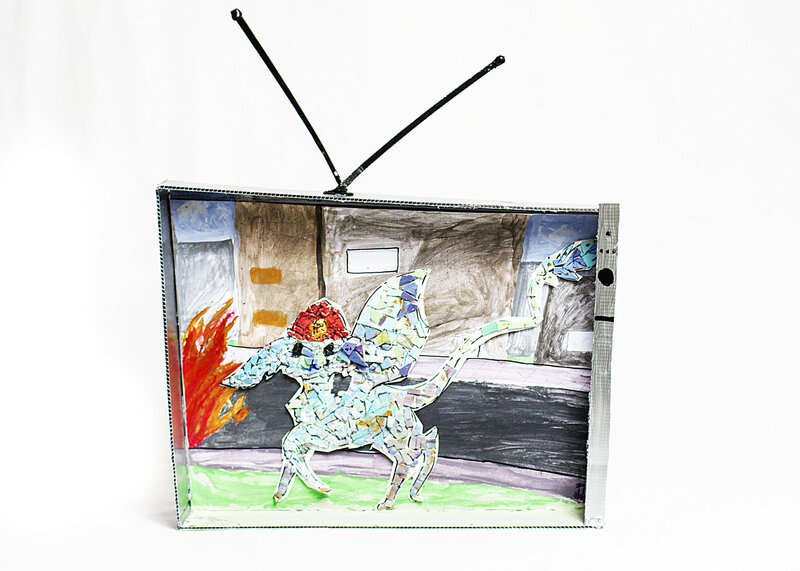 The students who created it are Rebecca Armstrong , Parker David. The statement from the artists is: Our project is a scene of Alexander Hamilton writing the Federalist papers, and we included ten facts about him. The theme for this piece is U.S. History, from Adams Middle School. The students who created it are Margaret Delori, Michael Griffith,Alan Socall, Manuel Rodriquez. The statement from the artists is: Disney World has made adults and children alike happy for many years and the front gates are iconic! The theme for this piece is Tampa History, from Lutz Prep Charter School. 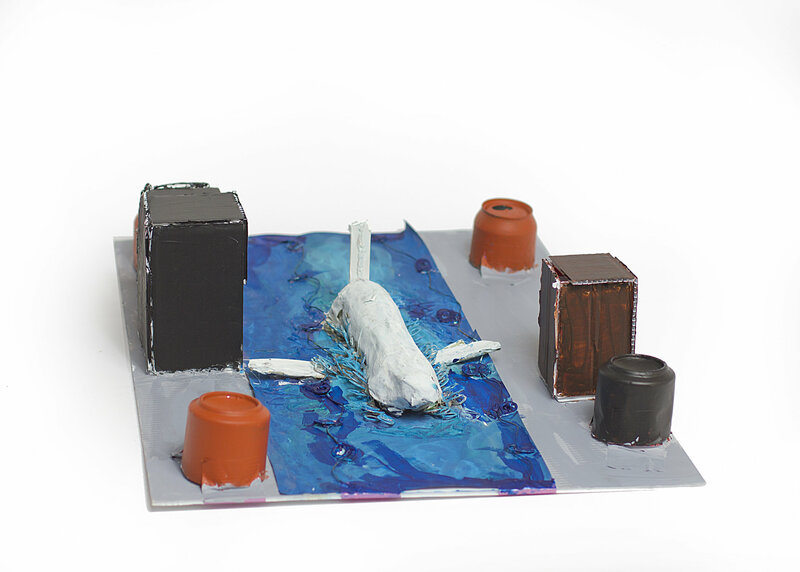 The students who created it are Blake Smith, Caleb Delgado, Franny Aguilar, Matthew Behrle. The statement from the artists is: The artwork represents an historic Tacobagga village. The theme for this piece is U.S. History, from Lutz Prep Charter School. The students who created it are Hailey Bullard, Jordyn Gwinner, Tori Brown. 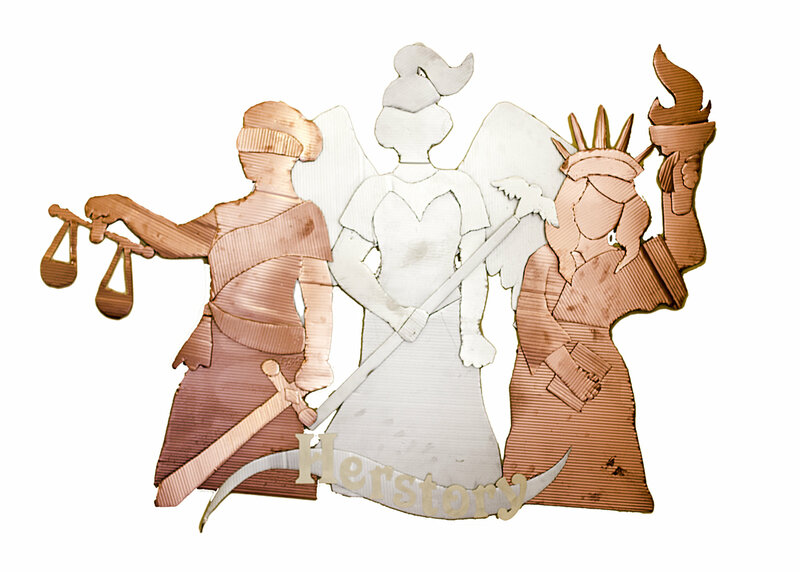 The statement from the artists is: Our project represents three war heroes and how they impacted our country. We hand picked the heroes and wrote how they changed the U.S. for good. We love the thought of war heroes and how brave they were. The theme for this piece is U.S. History, from Lutz Prep Charter School. 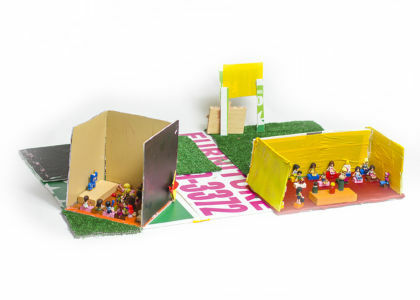 The students who created it are Anna Iglesias, Chloe Dudley, Olivi Mairn. 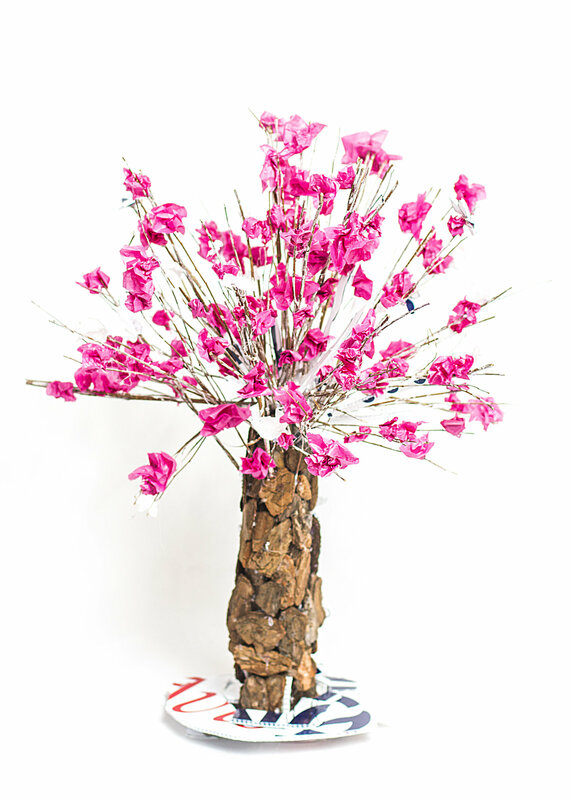 The statement from the artists is: Our work is inspired by the Cherry Blossom trees in Washington D.C. The Cherry Blossom trees were a gift from Mayor Yukio Ozaki of Tokyo to the city of Washington, DC. in 1912. The theme for this piece is Tampa History, from Lutz Prep Charter School. The students who created it are Adam Thompson, Elena Melikian, Sarah Brown. The statement from the artists is: This piece of artwork shows the pirate boat of Jose Gaspar from the 1900's. 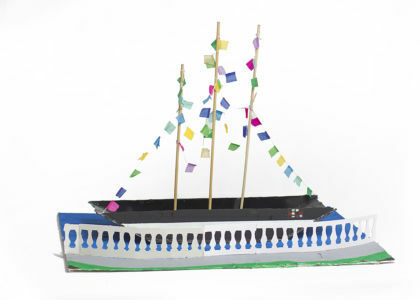 We were inspired by the fact that the Gasparilla parade has been going on since 1904. 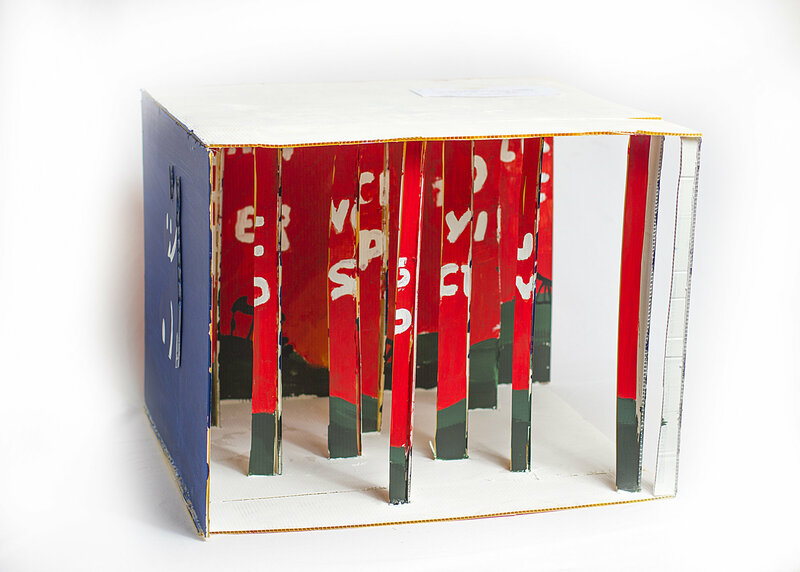 The theme for this piece is U.S. History, from Roland Park K-8. The students who created it are Molly Keith, Anna Mullins, Sofia Palma. The statement from the artists is: This piece represents Shay's Rebellion, the English taxing farmers for their crops. 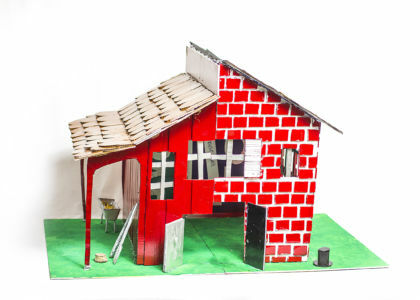 The barn represents the farmers who were lower in class and were unhappy with the taxes. The fancy larger house represents the English who were higher in class and more rich. 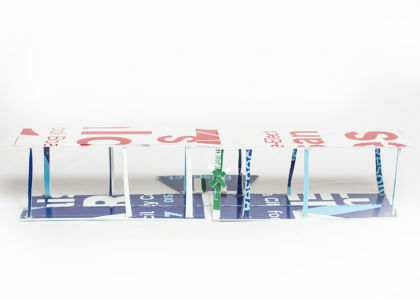 The way this piece was built represents the conflict between both sides. 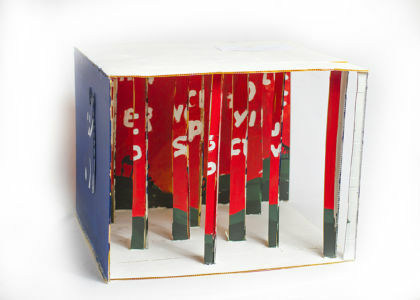 The theme for this piece is U.S. History, from Roland Park K-8. 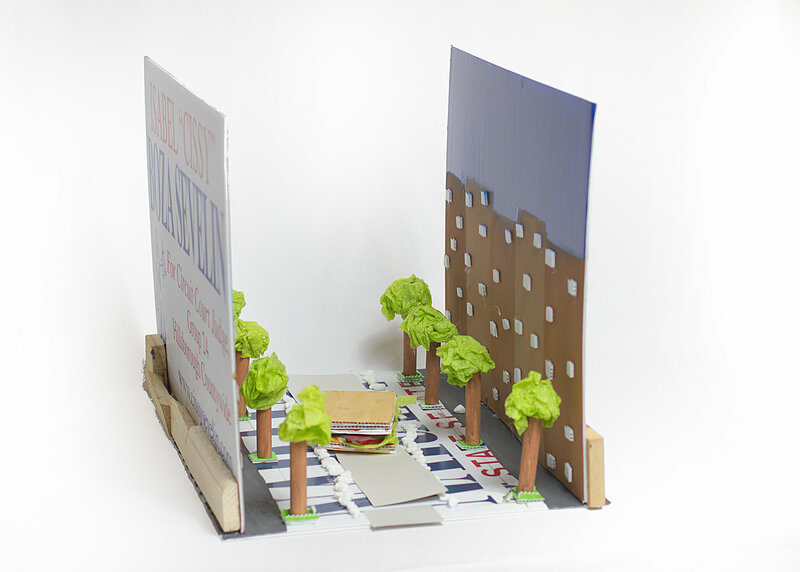 The students who created it are Shrisha Saravana, Caroline Hedger. The statement from the artists is: Our piece is inspired by a tableau presented at the One Women's Suffrage Parade of 1913. It shows Columbia, the female personification of the American Republic and a Goddess of Victory, Lady Justice, and Lady Liberty. 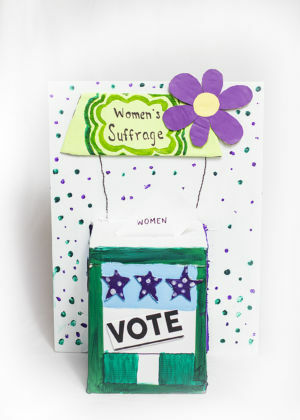 These powerful, symbolic women are our tribute to the ongoing fight for women's rights, and the historical victory of women's suffrage. 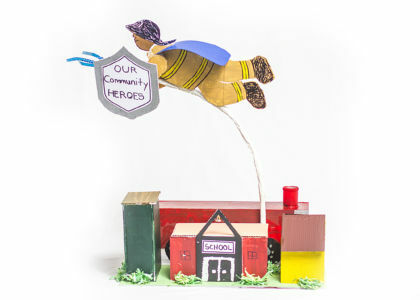 The theme for this piece is Firefighters as Superheroes, from Adams Middle School. The students who created it are Jayda Urbino, Chuntierra Packer. The statement from the artists is: Red is a powerful color. A hero in red is stronger. A woman in red is strongest. The theme for this piece is U.S. History, from Roland Park K-8. 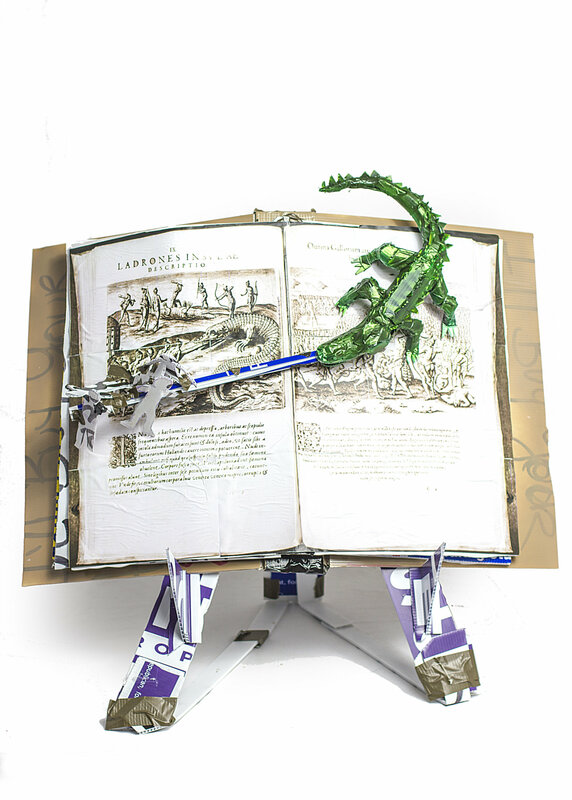 The students who created it are Jeremy Bryant, Juvenal David, Christopher Biggins. The statement from the artists is: This art reflects the current issues of Donald Trump's presidency, and shows a fireman putting out the fire that is Trump! The building on fire is a metaphor for the political situations going on in our society. 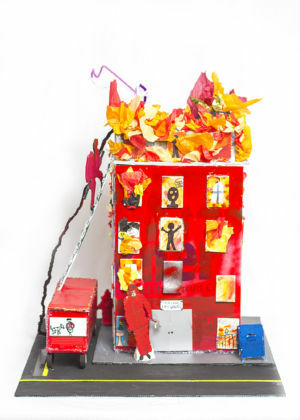 The theme for this piece is U.S. History, from Roland Park K-8. 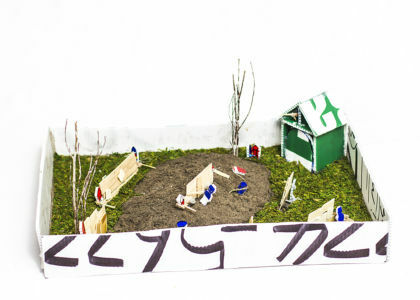 The students who created it are Ella Mendelowitz. 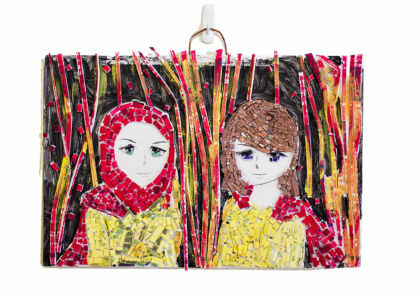 The statement from the artists is: My art represents the history of women's rights. I used three major symbols of women's rights in my design: the feminine symbols, the symbol for the women's rights movement, and the hat they wore a long time ago while fighting for the 19th amendment. I was inspired by the most recent women's march, and the advancements women have made throughout history. I hope you are inspired by my art and will work with me to honor women everywhere! 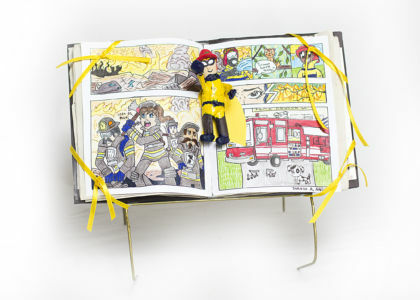 The theme for this piece is Firefighters as Superheroes, from Wilson Middle School. The students who created it are Ava Lazzara, Lauryn Kyle, Gabby Ramputi, Josie Stanton. The statement from the artists is: This piece represents a tragedy that happens everyday.We are showing respect to the people who put their lives at risk everyday, firefighters. We were inspired by the grandfather of one of our group members, who has been a fireman for 27 years. He has shown great courage. our main point is to persuade our viewers to show more gratitude!! 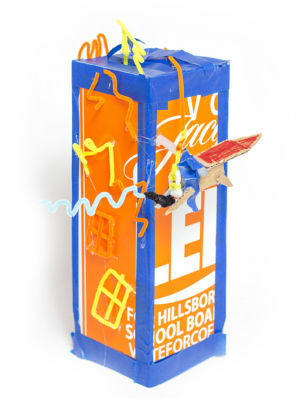 The theme for this piece is Tampa History, from Wilson Middle School. 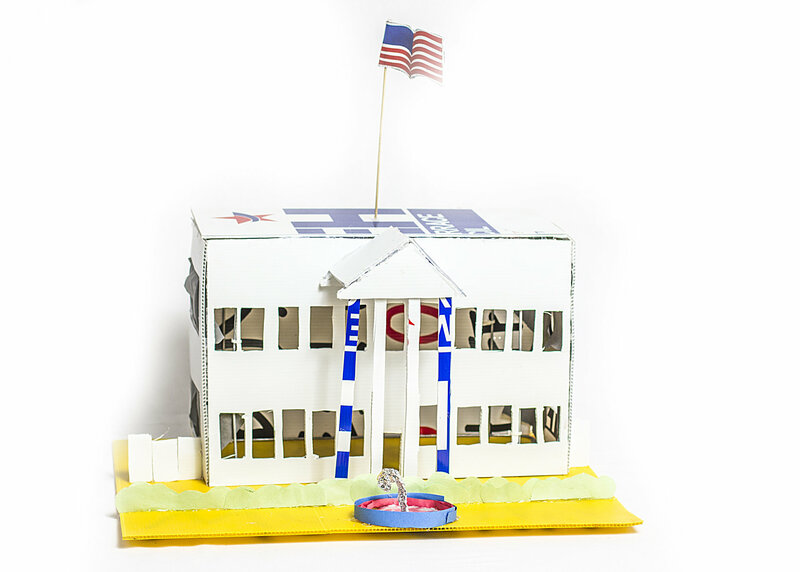 The students who created it are Skyla Rogers, Lily Quintana, Karina Santos. The statement from the artists is: We created this ship because Gasparilla inspired us to portray Florida's colorful history with pirates. The pirate ship we made is tilted to show it moving in the water. 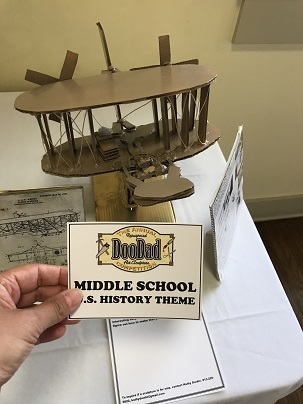 The theme for this piece is U.S. History, from Wilson Middle School. 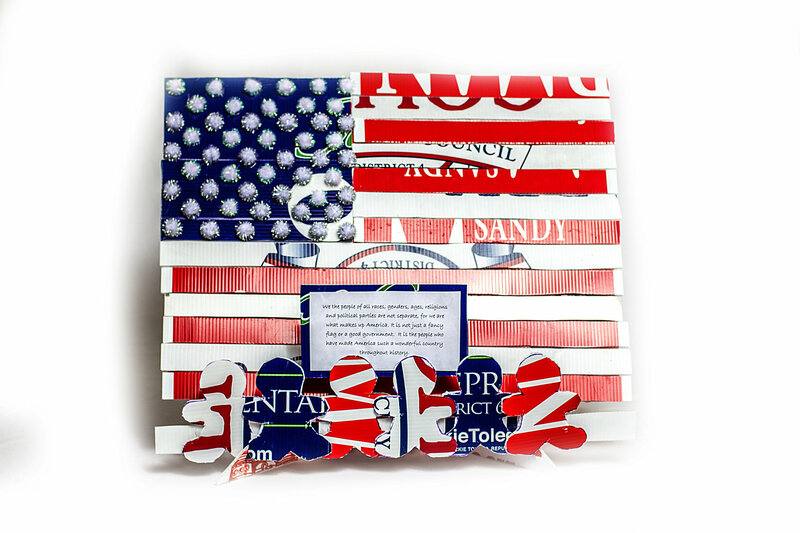 The students who created it are Reese Friar, Sydney Hartley, Grace Griggs, Bridget Devlin. The statement from the artists is: We believe an important part of U.S. history are the presidents. 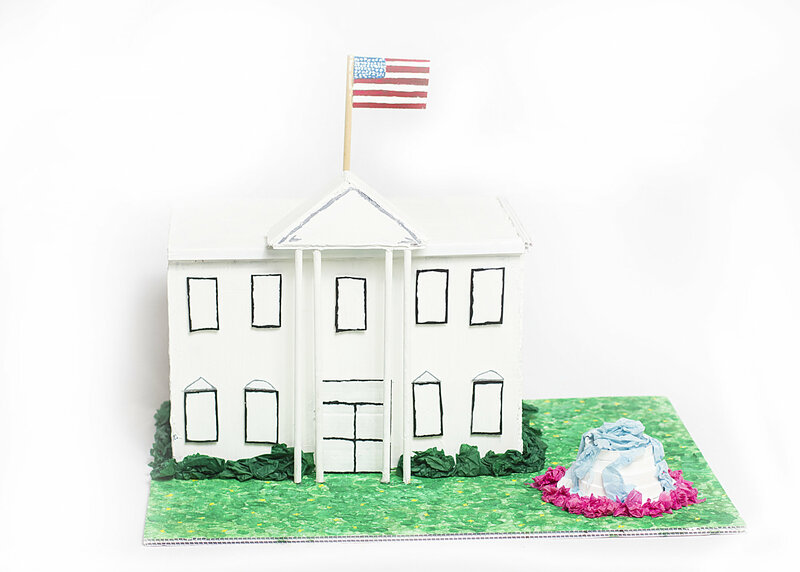 We created the White House to represent them; it's where they live with their families, where they have their offices, and where they make important decisions. We created the front yard garden with a fountain and flowers. We also put the American flag right on top as if to say "God Bless America". The theme for this piece is Tampa History, from Wilson Middle School. 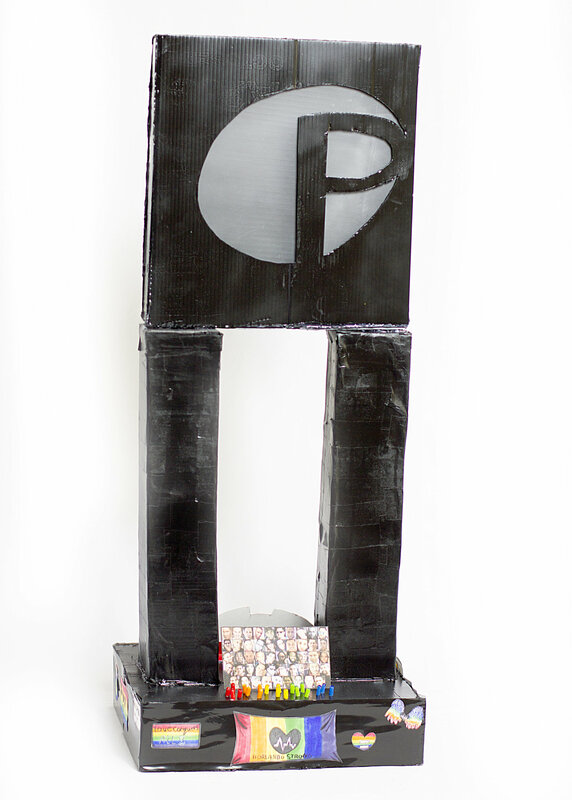 The students who created it are Maddie Hill, Tatianna Zaldivar, Casey Butler, Lydia Kamp. The statement from the artists is: A huge event in Tampa's history is Gasparilla. 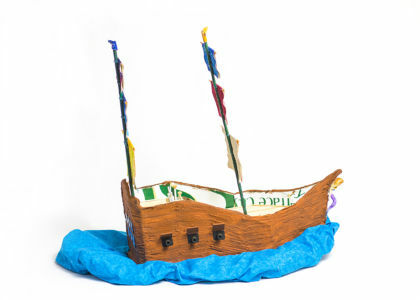 For our sculpture, we chose "Gaspar's Boat" because it has a major role in the Gasparilla Boat Invasion. Gaspar and the boat are icons in Tampa. We even have a month long celebration which re-enacts Gaspar invading Tampa, and getting the key to the city from the mayor. We believe our sculpture captures the essence of Tampa and the Gasparilla invasion. 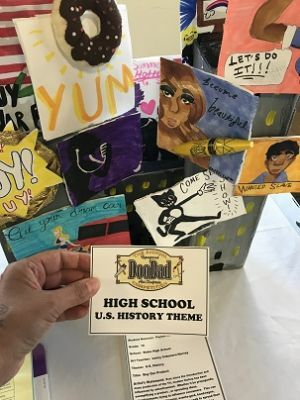 The theme for this piece is U.S. History, from Wilson Middle School. The students who created it are Olivia Munch, Cadence Busbee. 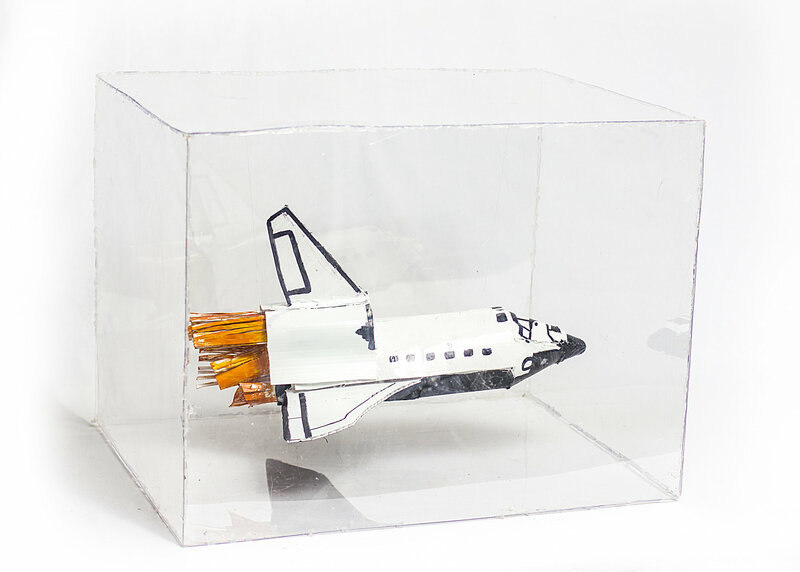 The statement from the artists is: We believe that a huge part of both U.S. and Florida history is the space program at the Kennedy Space Center. 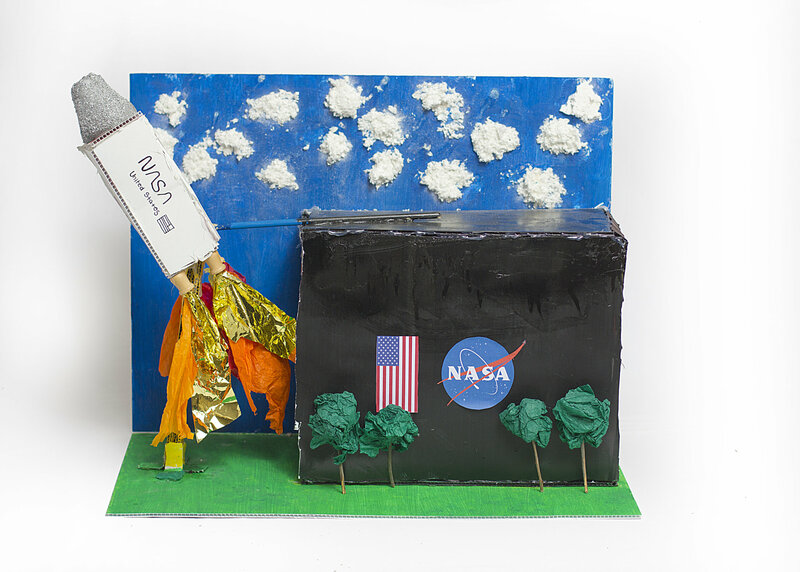 Over time, we discovered how impactful our discoveries in space have been to our world.We chose the Vertical Assembly Building and a rocket to represent the space program and to celebrate the engineering and science that it takes to explore space. 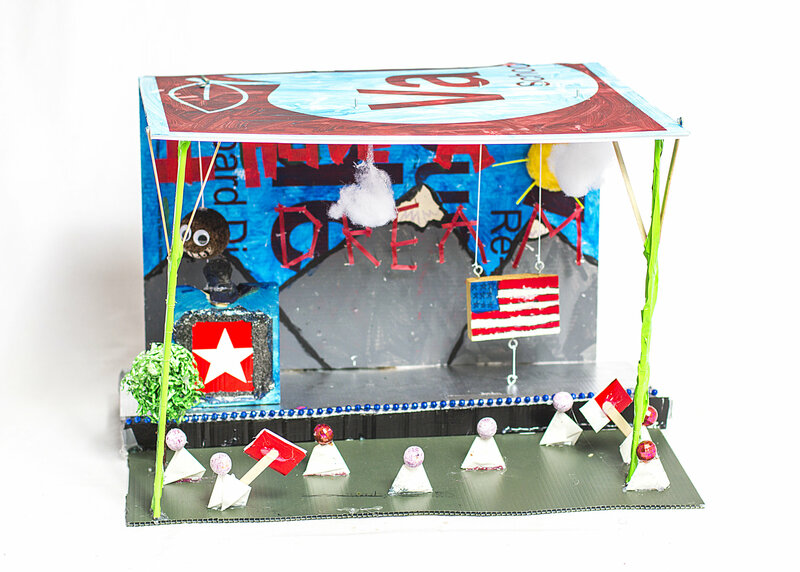 The theme for this piece is U.S. History, from Lutz Preparatory. The students who created it are Dylan Harmon, Jordan Higdon, Kai Campbell. 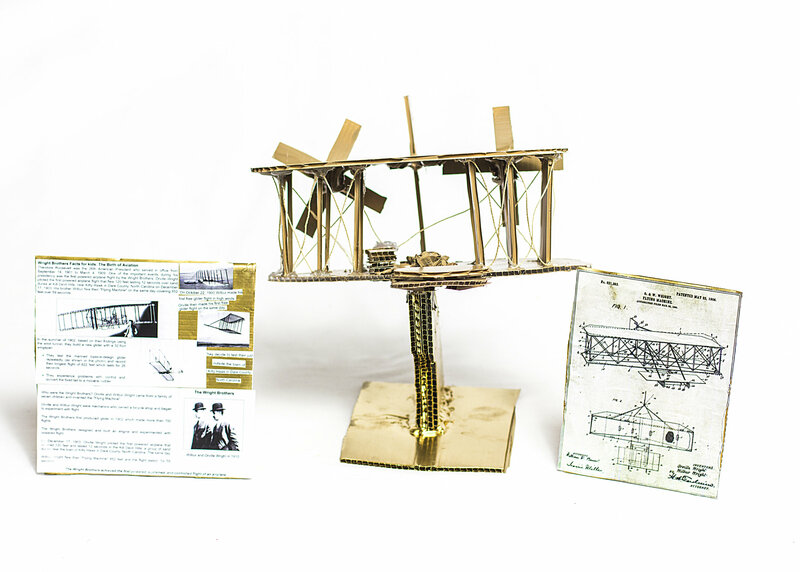 The statement from the artists is: This project is based on the U.S. History of the Wright Brother's airplane. 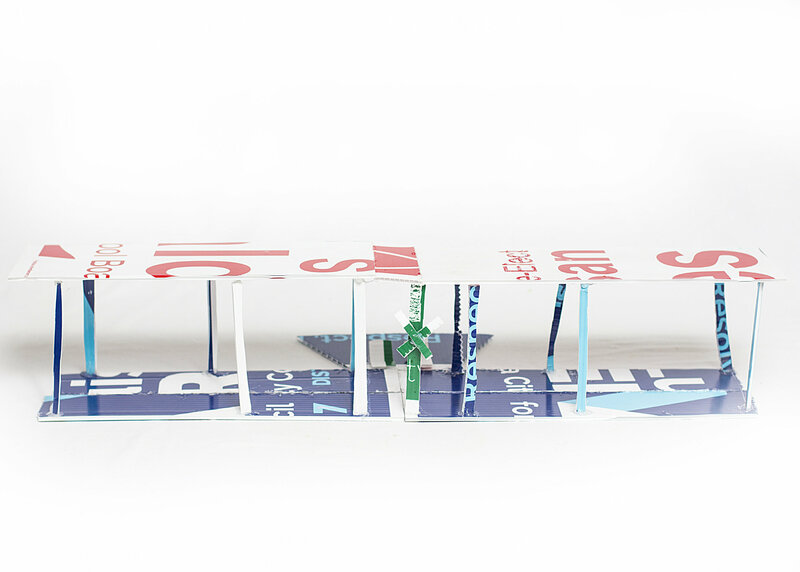 We were inspired to make this project because it changed transportation forever. The theme for this piece is Firefighters as Superheroes, from Adams Middle School. 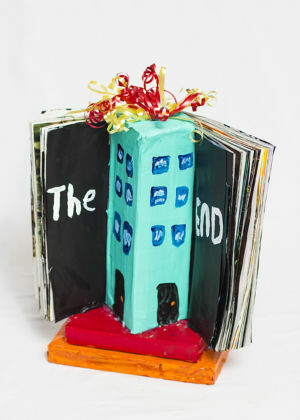 The students who created it are Barbara Rivera-Garcia, ShelbyHammett. The statement from the artists is: The water dragon Elloit is always walking around the town putting out every little fire he sees. The theme for this piece is Firefighters as Superheroes, from Ferrell GPA Middle Magnet. The students who created it are Israth Anwar. 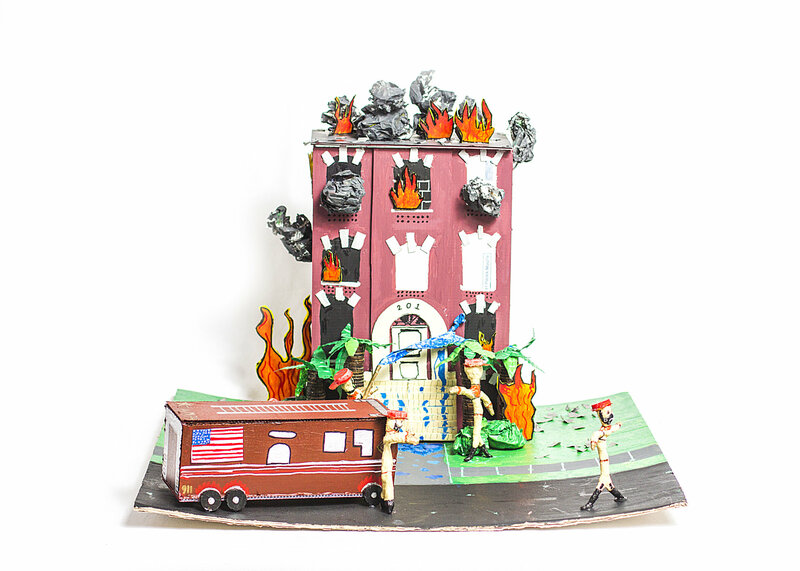 The statement from the artists is: The subject matter of my piece is a comic book that depicts firefighters as superheroes. The meaning of the images in my artwork is to show how they positively impact our world by showing what they do. 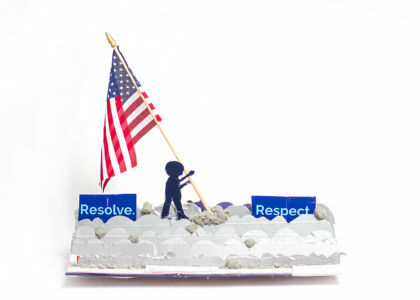 The theme for this piece is U.S. History, from Ferrell GPA Middle Magnet. The students who created it are Suraia Anwar. 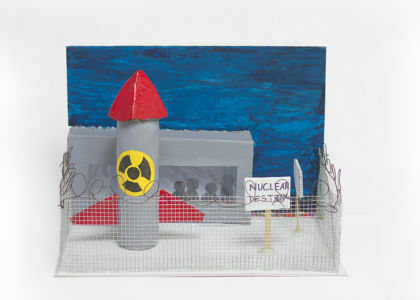 The statement from the artists is: The subject matter of my artwork is the Manhattan project. The meaning of my artwork is to show a period of time when the government was funding nuclear experiments to make nuclear weapons, and to show how dangerous they are. The theme for this piece is U.S. History, from Ferrell GPA Middle Magnet. The students who created it are Elizabeth Tibbs, Kiara Alvarez. 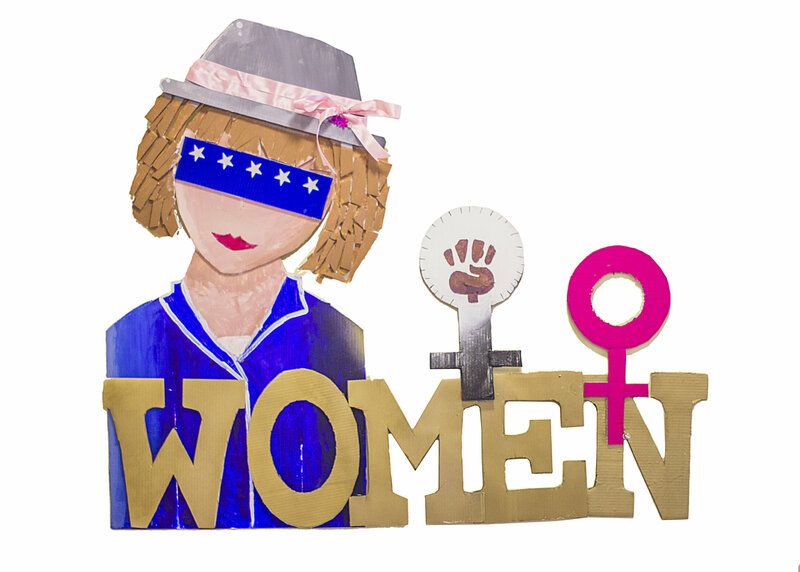 The statement from the artists is: The meaning of the sculpture was to show how women gained the right to vote during the women's suffrage movement. This is a crucial event in U.S. History. The theme for this piece is Firefighters as Superheroes, from Ferrell GPA Middle Magnet. The students who created it are Dianelys Alicea. The statement from the artists is: The front of my design shows the words "Fight" in white as the title of a book with black pages. 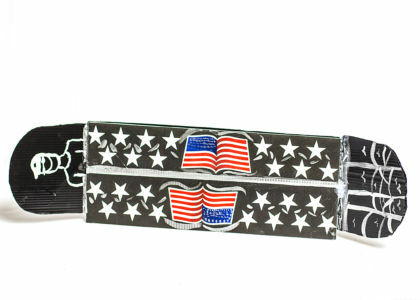 This is stacked on other books painted in fire colors to represent firefighters. 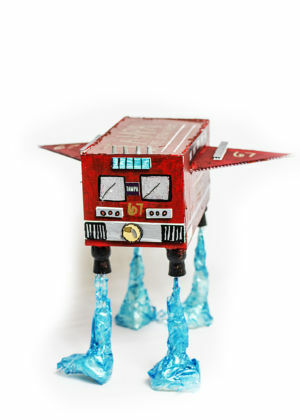 I used ribbon to represent fire coming from a building that I painted blue to represent the water used to fight the fire. 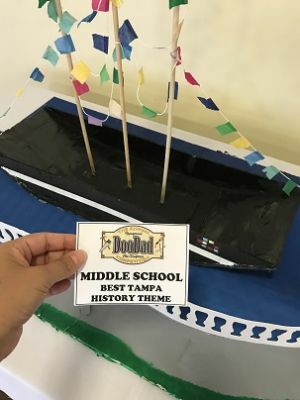 The theme for this piece is Tampa History, from Ferrell GPA Middle Magnet. The students who created it are Kourtney Moore. The statement from the artists is: 2004 commemorates the year the Lightning won the Stanley Cup. I want the viewer notice the size of the lightning bolt and person, and conclude that they are important to Tampa's history. Sports are very popular and make a big impact on many fans who keep track. 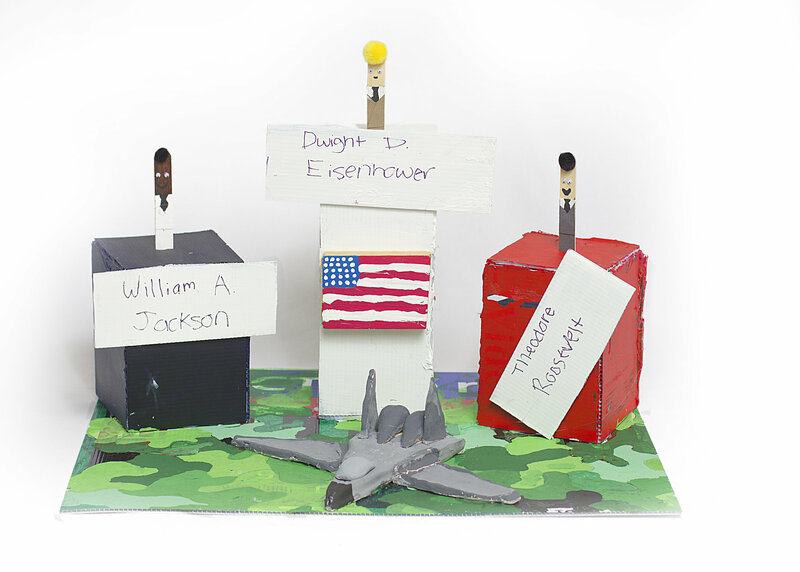 The theme for this piece is U.S. History, from Ferrell GPA Middle Magnet. The students who created it are Mikia Shaw, Chloe Thornton. The statement from the artists is: The subject matter of this piece is the first African American attending a formerly all White school. We were trying to get viewers to see the three girls in the front to emphasize putting the attention on them. The theme for this piece is U.S. History, from Ferrell GPA Middle Magnet. The students who created it are Oris Hernandez. 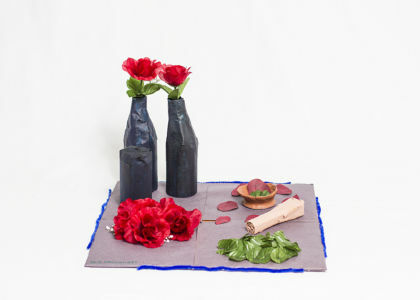 The statement from the artists is: I am trying to show how Native American's used roses and herbs in making medicine. The theme for this piece is Tampa History, from Ferrell GPA Middle Magnet. 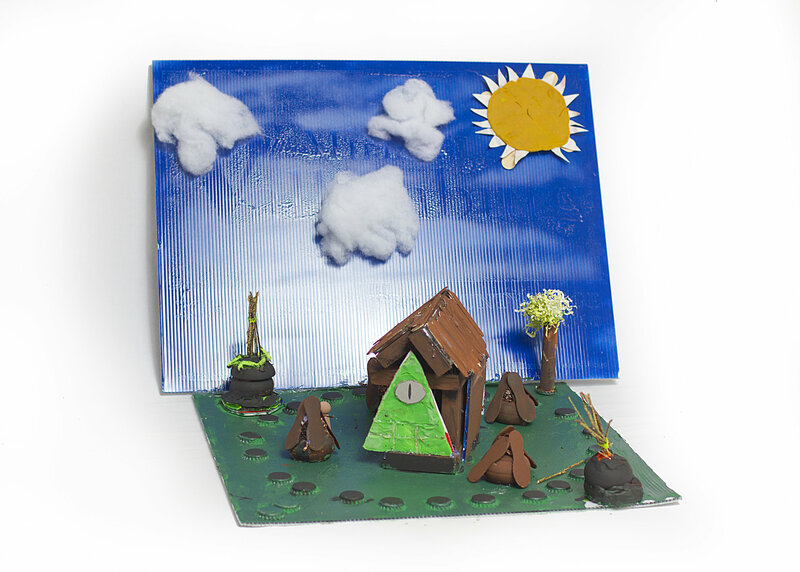 The students who created it are Jadelyn Aguilar, Stephanie Lampety. 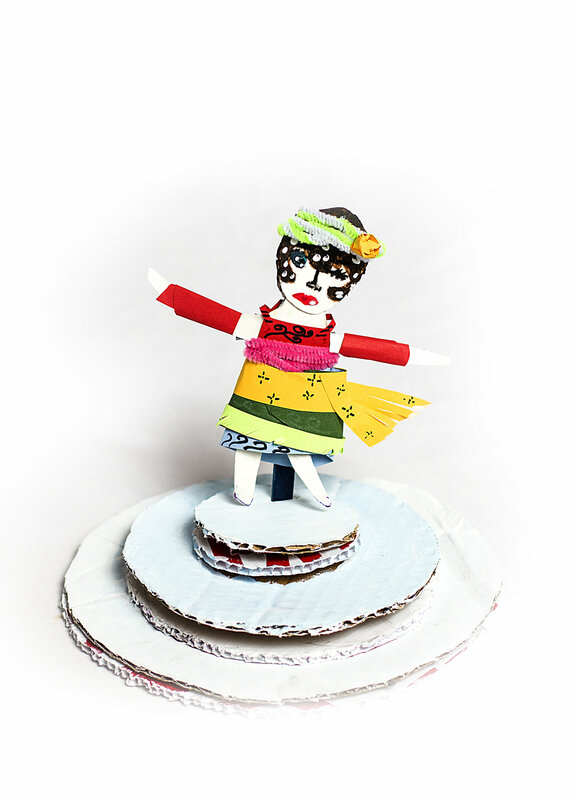 The statement from the artists is: The meaning of the image is a Latin girl who wants to spread Hispanic culture everywhere so people can enjoy it. The dancing and vibrant colors of her dress represents the Hispanic heritage of Ybor City. 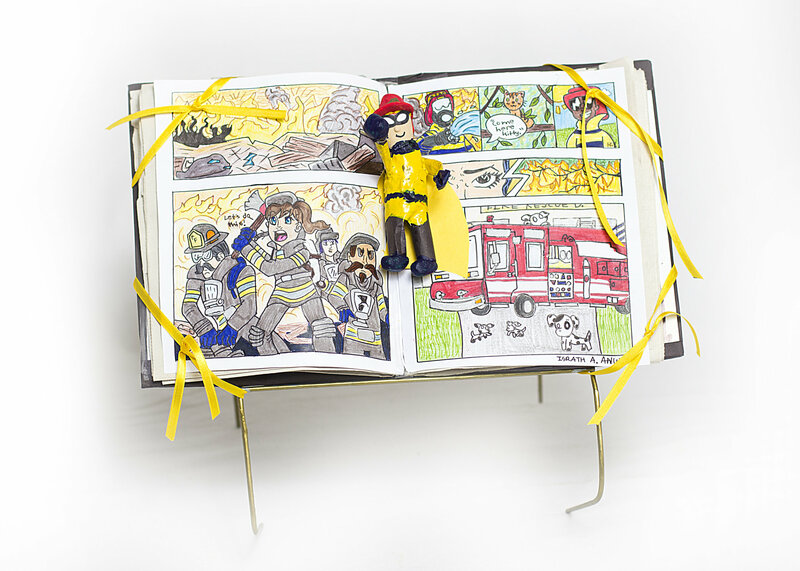 The theme for this piece is Firefighters as Superheroes, from Ferrell GPA Middle Magnet. The students who created it are Bryce Calleja, Jania Lyons. The statement from the artists is: The images in this piece represent the axe as a superhero firefighter putting out a giant flame. The theme for this piece is U.S. History, from Ferrell GPA Middle Magnet. The students who created it are Callie Shoemaker, Gianna Trejo. The statement from the artists is: The subject matter of this piece is the crash of U.S. Airways flight 1549 into the Hudson river. We made this piece to represent a very interesting and inspiring piece of recent U.S. History. The theme for this piece is Tampa History, from Adams Middle School. The students who created it are Najiyyah James. The statement from the artists is: Skate boarding is relaxing, and this work is in honor of the Bro Bowl. The theme for this piece is Tampa History, from Lutz Prep Charter School. 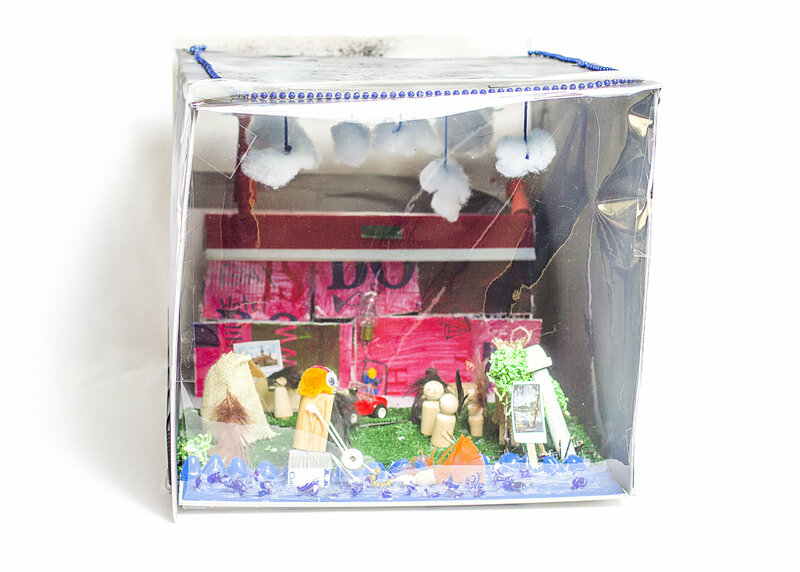 The students who created it are Kristal Makhija, Daniela Carballo, Isabella Lopez, Olivia Muinois. The statement from the artists is: We chose to represent the beautiful history of Tampa through Ybor City, and a Cuban sandwich with cigars. The theme for this piece is U.S. History, from Ferrell GPA Middle Magnet. 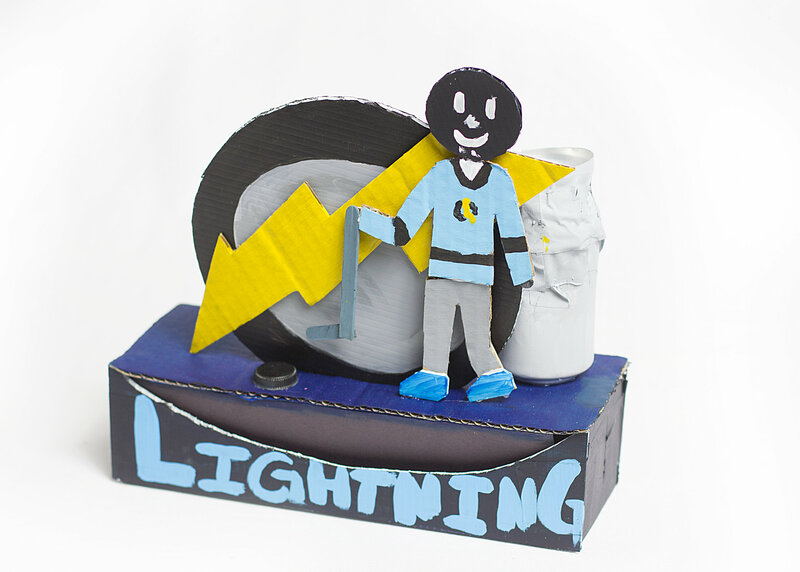 The students who created it are Rochelle Appolito, Alina Spates. The statement from the artists is: The subject matter of this sculpture is the sign for the Pulse night club in Orlando with details about the victims of the shooting that occurred there. 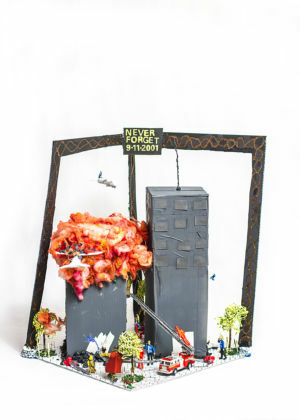 The meaning of this sculpture is to show that even after such a horrible event such as this, the community stands strong and fights for each other. We chose this because the event impacted the world, us, and many around us so much. 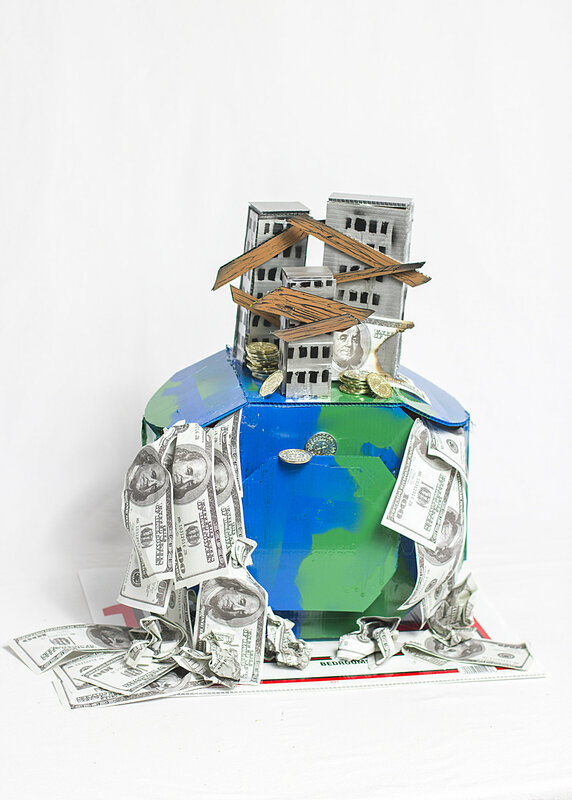 The theme for this piece is U.S. History, from a Homeschool student. The student who created it is Nick Wagner. The statement from the artists is: I thought doing the first plane would be fun. I've read about it and it's a pretty interesting subject. They spent so many years trying to figure out how to make that plane fly. The theme for this piece is U.S. History, from Lutz Prep Charter School. The students who created it are Claire Bazzini, Jessica Chao, Brynn Wilary, Mirna Gerges, Kaitlyn Bradley. 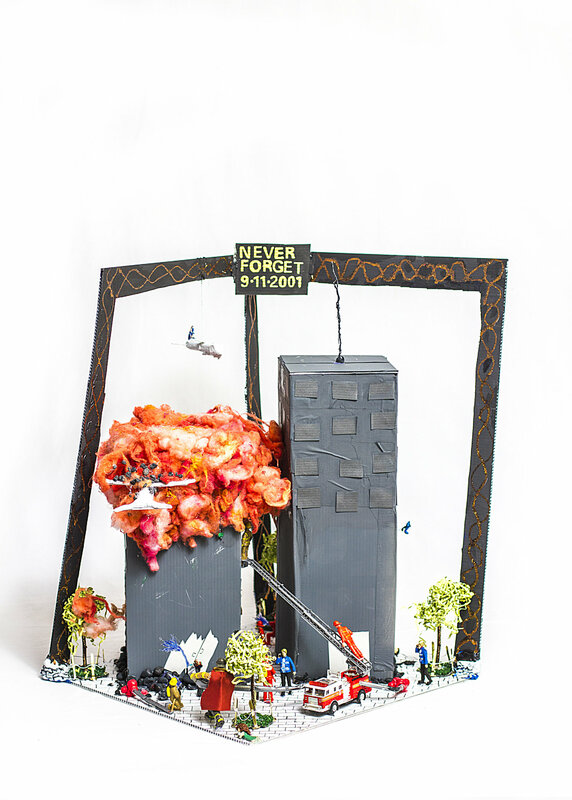 The statement from the artists is: Our artwork is about the tragedy of 9/11 in a 3D picture with lots of help from firefighters. We used a lot of tools and materials such as a hot glue gun, campaign signs, and paint. This scene inspired us from the terrorism around the world, and we wanted everyone to remember this horrible event. The theme for this piece is U.S. History, from Lutz Prep Charter School. The students who created it are Devan Parekh, Beshoy Maksimous, Aidan Hurley, Aidan Brown . The statement from the artists is: Martin Luther King, Jr.’s tremendous show of courage inspired us for this project. We chose to do an abstract take on it instead of a realistic take on it. This event changed how others looked at African Americans. The theme for this piece is U.S. History, from Lutz Prep Charter School. The students who created it are Raina Mayerschoff, Madison Rewald, Emma Grace Ellis. 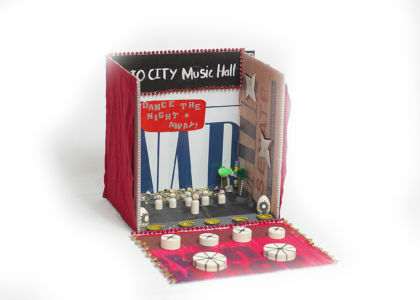 The statement from the artists is: We built Radio City Music Hall, and used campaign signs, wood pieces, bottle caps, and much more. Joy is portrayed in our project and so is enjoyment. Our inspiration is from the beautiful architecture at Radio City Music Hall. The theme for this piece is U.S. History, from Blake High School . 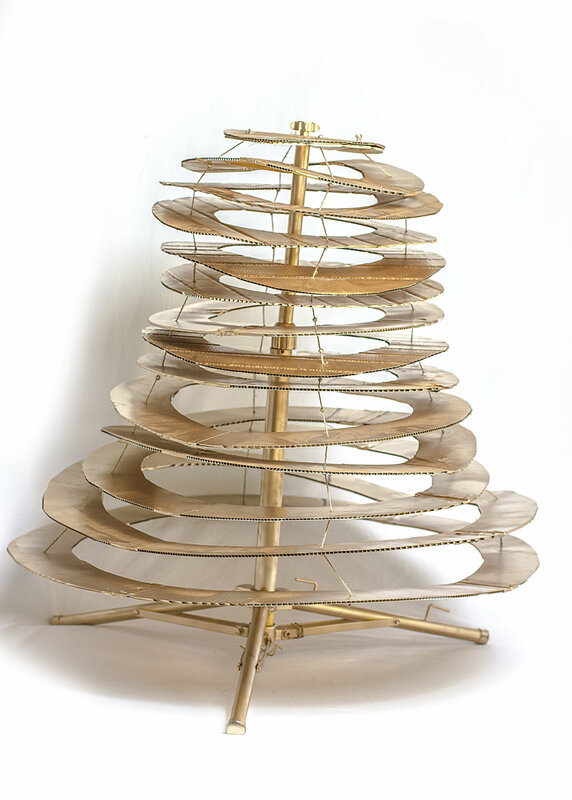 The students who created it are Gleimi DeJesus . The statement from the artists is: This rocket ship represents the history of space exploration. I find that space exploration is relevant today through our government and especially in Florida. The theme for this piece is Firefighters as Superheroes, from Blake High School . The students who created it are Savon Watson . The statement from the artists is: My piece depicts a firefighter in one of the most iconic superhero positions. In choosing to place him in this position , I compare the heroic actions of firefighters to those of superheroes. This piece represents my deep respect and admiration for those in fire and rescue services. The theme for this piece is U.S. History, from Blake High School . The students who created it are Payton Sherer . The statement from the artists is: Ever since the introduction and mass production of the TV, modern history has been influenced by advertisement. Whether it be propaganda, exemplifying a product , or spreading ideas, advertisements trying to influence consumers. This can be seen through testimonial, avante-garde, bandwagon, etc. Advertisements and advertisers seek to spread their messages. My piece symbolizes how our history has been shaped by these influences. The theme for this piece is Firefighters as Superheroes, from Blake High School . The students who created it are Leana Rosado . The statement from the artists is: This piece of the Orlando fire station was to convey the history of the first 6 firemen in the City of Orlando. During the 1800's, there wasn't enough consideration for fire safety. Until 1883, a disastrous fire took over a dressmaking shop due to a flammable item going up in flames. The two people who stepped in to help was P. Hyer, C. Grove, and W.C. Sherman. W.C. Sherman was one of the first volunteer firefighters and eventually became Chief of that department. The theme for this piece is U.S. History, from Blake High School . The students who created it are Emelyn Harvey . 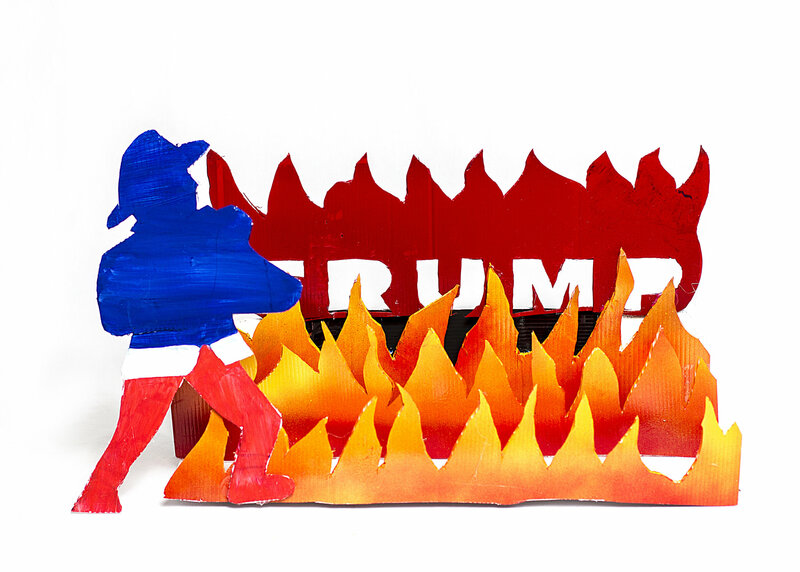 The statement from the artists is: The purpose of this piece is to show the opposing differences between the Democratic and Republican parties. More specifically, their views on energy resources, and the environment. While Democrats prefer renewable energy resources, Republicans tend to prefer oil and other non-renewable resources. Their disagreements on this problem are important in US history, especially in the last decade. The theme for this piece is U.S. History, from Blake High School. The students who created it are Phoebe Peeno. The statement from the artists is: The Liberty Bell is one of the most important symbols of American freedom and independence. My reproduction of this landmark is meant to emphasize the significance of its place in American history as well as it's influence on abolitionist movements in the late eighteenth to early nineteenth century. The theme for this piece is U.S. History, from Lennard High School. 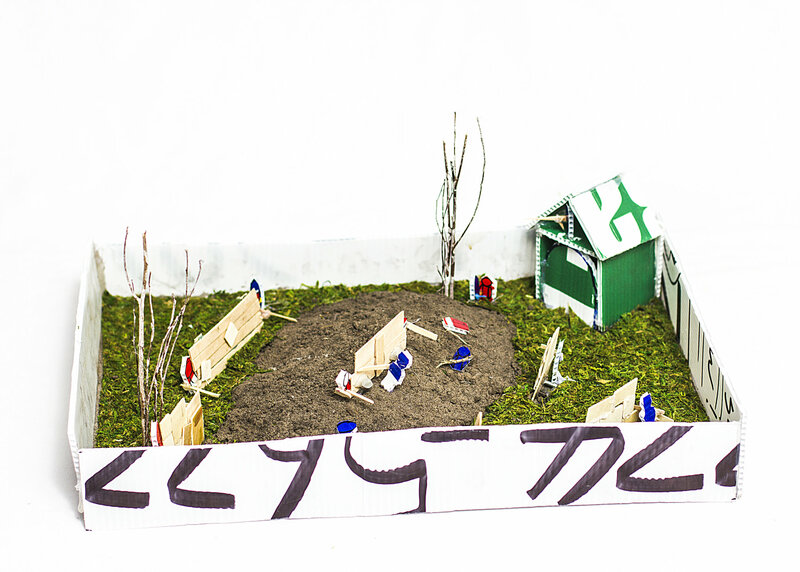 The students who created it are Samacha Nernginn. The statement from the artists is: I tore apart and blended several campaign signs, mixed with foam to create a clay type mixture, then I carved out the illustration of Sacagawea. 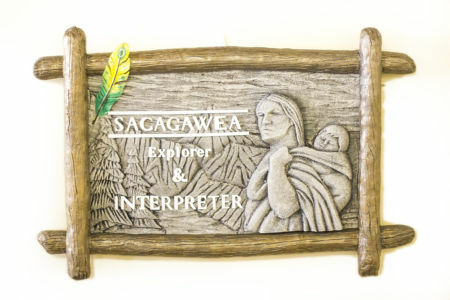 I first thought of Sacagawea after reading the US history category, because back then Native Americans were not treated fairly but she was integral in colonist/native American relationships. 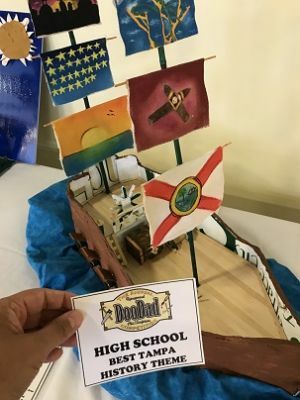 The theme for this piece is Tampa History, from Steinbrenner High School. 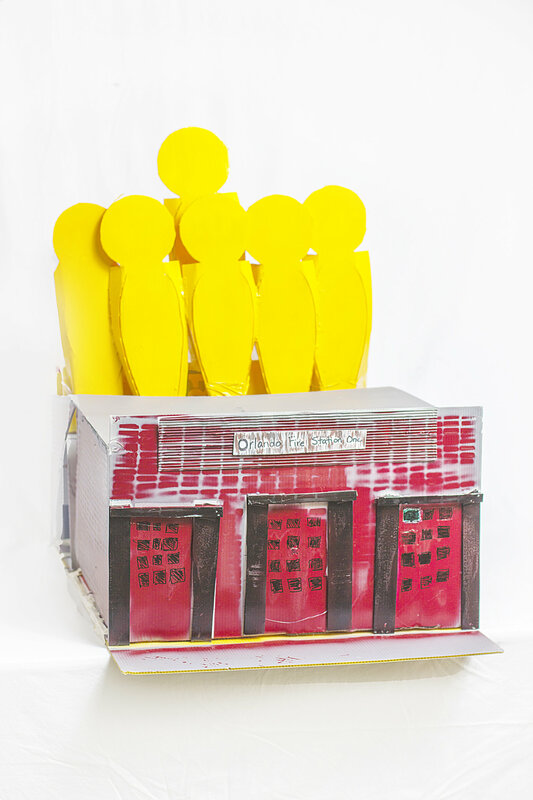 The students who created it are Danielle Greif, Zoe Hunter, Gentry Massey-William, Vaness Ibarra, Emma Scarlatella . The statement from the artists is: My peers and I were taken by Jose Gaspar, and how he controlled the Tampa seas in a manner of speaking. We wanted to represent him and Tampa in one shot since the two are forever linked. 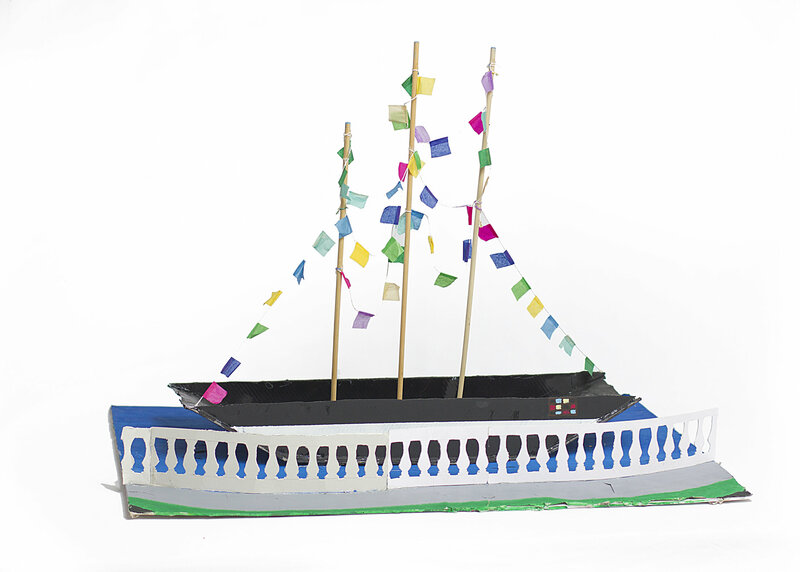 By constructing the boat, we are honoring him and Tampa's history. 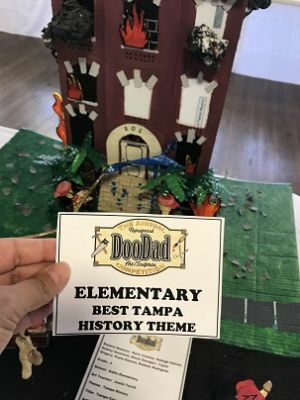 We chose the Tampa history category to represent our rich and energized culture in an exciting way. 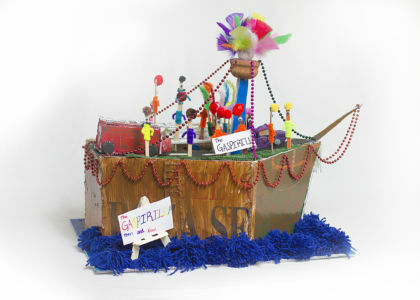 The boat represents Gasparilla, an event that is home to Tampa Bay. 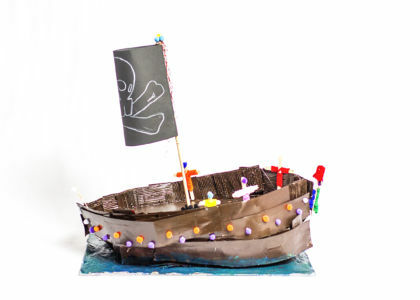 Gasparilla is the celebration of a pirate invasion lead by Jose Gaspar and his crew. He inspires Tampa in many ways today. The theme for this piece is U.S. History, from Blake High School. The students who created it are Sammi Parker. The statement from the artists is: The crash of Wall Street was the first event to start the Great Depression. In this time many people lost their jobs, and homes. The Tuesday when this happened is now labeled "Black Tuesday." Many people were struck by this almost immediately. The world was figuratively bleeding money. Even the rich people struggled with funds. Today is the last day of the physical exhibit of the 7th Annual Doodad Repurposed Sculpture Competition at the Florida Center at the Florida State Fair. It has been a fabulous event. 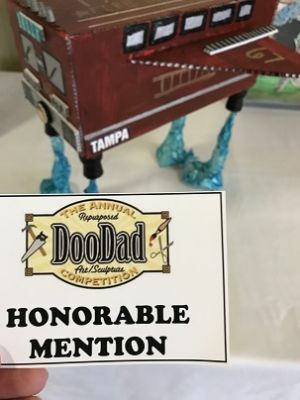 You can continue to enjoy these fabulous creations of the talented young artists at our website, www.doodadoftampa.org. Thank you to our host and in kind sponsor -- the Florida State Fair Authority -- we have so loved being at the State Fair. 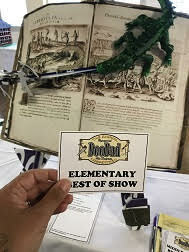 We are already looking forward to next year, with the theme "Shoes, a Treat for Your Feet", doodads plastic bags and snack wrappers. Guidelines are available on our website.